Eye: Crimson and garnet flashes. Nose: Aromatic luxe - initially old oak, roasted pear, overtones of almond paste and finally nougat and a delicious rancio. Palate: A complex and full mouth, with waves of flavors. Final notes of flowers, and an exquisite rancio. 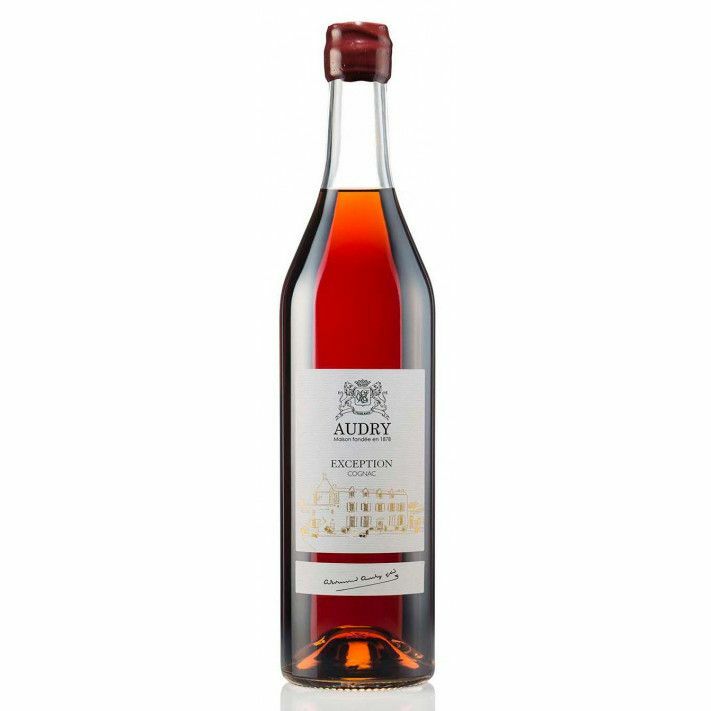 The oldest and finest of Audry’s blended line of Cognacs, the Audry Excéption Cognac is a stunning blend of Grande and Petite Champagne eaux-de-vie. As a Hors d’Age Cognac, this is a fantastic example of Audry’s ability to handpick and blend their oldest stocks from the cellar. It is aged between 40 and 60 years, and is extraordinarily rare. Enjoy a fruity and rich Exception Cognac with an exceptional rancio that exhibits all of the best characteristics of a mature Fine Champagne treasure: "I am delighted by the most coveted virtue of all great Cognacs; the rancio, this precious gift comes as a result of the oxidation process and a very long ageing period." explains Paul Pacult from Audry. This Cognac house prides itself on producing high quality, small batches of fine Cognac, releasing limited numbers per year. The Fine Champagne crus, made up of the Grande and Petite Champagne are highly sought after due to the high quality Cognacs that they produce. Audry have gained a reputation for carefully constructing incredible blends between the two terroirs. Due to the high chalk soil and limestone subsoil, the eaux-de-vie from this region are particularly refined. The soil drains easily, and the vines remain consistently hydrated thanks to millions of years of fossilization and its unique maritime climate. That combined with its optimal absorption of sunlight located on the hillside of the Cognac region makes for a particular finesse. It is indeed no secret that the cellar of the Audry estate is full of large stocks of older casks, and therefore decades-old eaux-de-vie biding its time. After closing its estate in the 1950s, Bernard Boisson decided to blend his older stocks once more in 1978 and create a series of bespoke Fine Champagne Cognacs. The Audry Excéption is the ultimate expression of this Cognac house and their blending savoir faire. The secret to a Cognac such as the Audry Exception is producing without haste, and with respect of the premium terroir. This Cognac is out of this world, having been aged for six decades. Firstly it is distilled in Charentais alambic stills, using a ‘swan’s neck’ pipe which manages to capture the aromatic beauty of the Fine Champagne terroir. It is then left to sleep for decades in Limousin and Tronçais oak barrels, where the tannins and the spirit meld together with the help of oxidation in the cellar. They are gently awoken by the Master Blender, who marries them together to then be left once more before bottling. Enjoy this quietly and reflectively; taking in each and every aroma and flavor in a journey through the senses. Best served neat. The bottle is stylish and simple with the family crest and a gold-leaf sketch of the estate.